Adding a Remote Digital Display with Reset to a Mechanical Water Flow Meter. Mechanical water meters commonly used for residential and commercial water metering are typically “Totalizer Only.” This means that they simply measure the water that passes through them in their lifetime. The registers can only be read locally at the meter itself. This makes it difficult for landlords and property managers to read submeters that are only accessible within a private unit. It also requires that the previous reading is available to subtract from the current reading in order to calculate the usage within that time period. 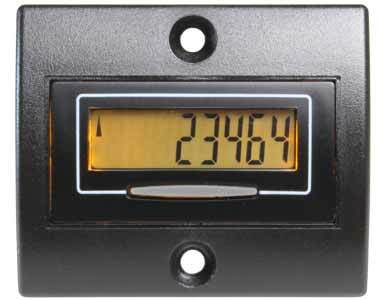 These meters can be easily be upgraded to include a remote digital display with reset. That upgrade provides many benefits to homeowners and landlords. Allows for remote display – greatly simplifies reading of meters that are in dirty, hard to reach, or inaccessible locations. Wire can be run from meter to a preferred reading location. 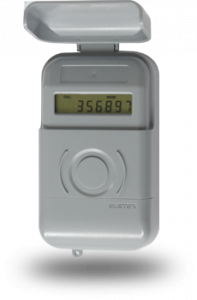 Makes meter reading easy – just one complete number, no separate dials for each digit. Adds reset function – eliminates the need to subtract the last reading from the current reading to calculate the usage for the time since last reading. Also makes it easier to use the meter to determine when a whole house water filter needs changing. The KAL-D06 is a DN32 size pulse counter with low and high frequency inputs (low frequency used for this application). It can be backlit using an external power source, and has a reset button. The reset button can be disabled, and an external reset switch can be used. Many landlords disable the reset button and add an external reset switch that requires a key to use. The unit comes with a plastic frame for panel mounting. A weatherproof enclosure is available for outdoor installations. The T210 is a weatherproof digital pulse counter that can be read and recorded with the PSR140 wireless “touch reader” (sold separately – call for details). It can also be used as a simple visual digital display like the KAL-D06. It accepts both low and high frequency inputs. The unit cannot be reset without the PSR140 programmer/reader. This is a great choice for landlords who have one meter to read, but plan on expanding and having many. You can use it as a simple display now, then later add the PSR140 and more T210 units to create an effortless water usage metering system for all properties. Our water meters can be purchased with everything needed to include a remote digital display at the time of installation. You can also purchase the accessories needed to retro-fit a pulse output switch (what is Pulse Output?) and digital display to a previously installed meter. Here is how you can upgrade your basic mechanical water meter to a meter with remote digital display and reset.